Stewardship: \ˈstü-ərd-ˌship: the activity or job of protecting and being responsible for something. In 1862 the Morrill Act was passed to support and maintain colleges of agriculture and mechanical arts, including a later provision that included the donation of public land. As one of the first land grant Universities, the University of California was well positioned to manage agricultural extension across the state as part of the Smith Lever Act of 1915. Today, many people think of California agriculture as strawberries, broccoli and rice; but it is livestock and forestry that dominated California working landscapes in those early days. 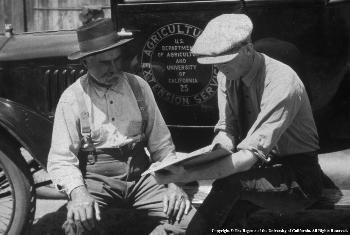 Farmer seeks assistance from UCCE farm advisor on the running board of a historic UC Cooperative Extension vehicle. Research and extension efforts to improve forestry practices and range production throughout California have evolved over time. Research questions gradually changed over the last 100 years from a “how can we economically produce more” perspective to how can rangeland management practices improve ecosystem composition and function? How can extension programs be employed to educate stakeholders and help land managers implement change? How can we conserve working landscapes for biodiversity conservation in a period of rapid development? 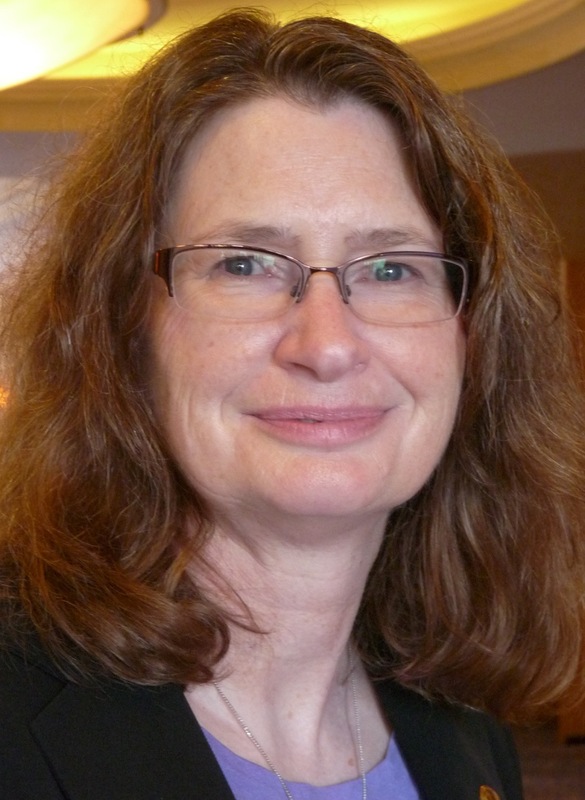 How can we assess and monitor management effectiveness? This year, the University of California Division of Agriculture and Natural Resources celebrates 100 years of UC Cooperative Extension serving as a research and outreach partner in communities throughout California. For an interesting read on this rich history and the evolution of UC rangeland management perspectives, see M. George, and W. J. Clawson’s The History of UC RangelandExtension, Research, and Teaching: A Perspective (2014). 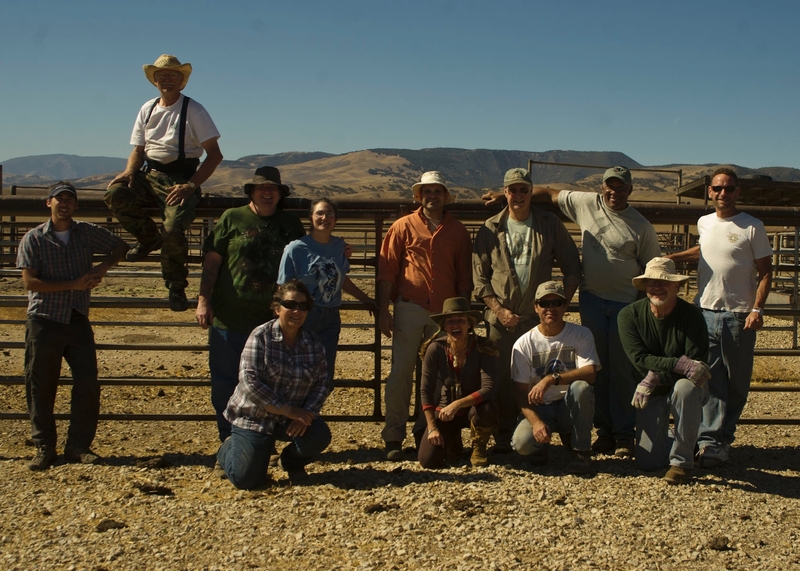 Additionally, UC ANR California Rangelands Website includes a free Annual Rangeland E-book; current project descriptions, publications, and online learning modules: http://californiarangeland.ucdavis.edu/. Maintaining and improving environmental quality on public and private land requires an informed strategy that encourages stewardship by land owners and community members. In present times, we face the challenges of managing land in the face of growing population, drought, invasive species, and climate change, just to name a few forces of global change. Out of necessity, our broader perspective on land management has shifted to one of “ecosystem stewardship” which is defined as a strategy to respond to and shape social-ecological systems under conditions of uncertainty and change to sustain the supply and opportunities for use of ecosystem services to support human well-being (Chapin et al. 2010). The stewardship framework focuses on the dynamics of ecological change and assesses management options that may influence the path or rate of that change. Using an ecosystem stewardship framework, the UC ANR’s California Naturalist Program is building astatewide network of environmental stewards. The program is designed to introduce the public, teachers, interpreters, docents, green collar workers, natural resource managers, and budding scientists to the wonders of our unique ecology and engage these individuals in the stewardship of California’s natural communities. The California Naturalist Program uses a science curriculum which includeschapters in forest, woodland, and range resources and management, geology, climate, water, wildlife, and plants. Experiential learning and service projects instill a deep appreciation for the natural communities of the state and serve to engage people in natural resource conservation. Land management is the focus of many of the partnering organizations that offer the California Naturalist Program. For example, land conservancies and preserves are involved including, Tejon Ranch Conservancy, at 270,000 acres the largest contiguous private ranch in California; Pepperwood Preserve, a private rangeland preserve dedicated to conservation science in the Northern SF Bay Area; UC Berkeley’s Sagehen Creek Field Station, a forested research station in the Sierra; UC Hopland Research & Extension Center, a rangeland research and education facility in California’s north coast region; and the Sierra Foothill Conservancy, a non-profit land trust in the Western Sierra Nevada including Fresno, Madera, eastern Merced, and Mariposa counties. Land trusts are increasingly responsible for conserving working landscapes and open space across the state and often rely on a trained volunteer corps to steward these valuable landscapes. UC ANR is pleased to advance training opportunities for those actively managing these lands. California Naturalists trained at these locations and more are involved in ecosystem stewardship, rangeland management, watershed restoration, and helping outdoor education programs that benefit the environment and people of all ages. Naturalists have donated over 13,000 hours of in state service in the last three years. These types of stewardship opportunities are essential for the active adaptive management that both public and private lands need to ensure resilience and continue to provide ecosystem services that we all rely on. These trained environmental stewards are an important part of this growing community of practice who not only steward land but also pass on critical knowledge about California’s natural and managed ecosystems. With Special Thanks to Brook Gamble. Barbara Allen-Diaz, University of California Vice President, Division of Agriculture and Natural Resources, talked with California Ag Today about the 100th anniversary of the Cooperative Extension. On May 8, 1914, President Woodrow Wilson signed into law the Smith-Lever Act, which created Cooperative Extension to help farmers, homemakers and youth apply the latest university research to improve their lives. “Pollinators are an incredibly important part of our ecosystems throughout the world so, not only for food production,” commented Allen-Diaz, “but also for the health of all our ecosystems. “For 100 years, we have engaged our local communities to work with us in problem-solving issues of importance in agricultural natural resources, nutrition, urban horticulture, home economics, and use development,” said Allen-Diaz.